Tea utensils: for Japanese green tea preparation, specific and useful utensils exist that are good to know about, from Kyusus and Chazutsus, to Chasakus. In the Japanese >>traditional preparation<< of green tea various special utensils are used that not only look beautiful, but which are also perfectly designed for making green tea. Tea lovers who drink tea on a daily basis will quickly discover which specific utensils are advantageous and refine the aesthetic enjoyment of tea culture. For health-conscious tea drinkers, >>preparation<< using certain equipment also offers advantages for achieving optimum health effects. In the following, we will explore the practical and aesthetic value of using each individual tea utensil. 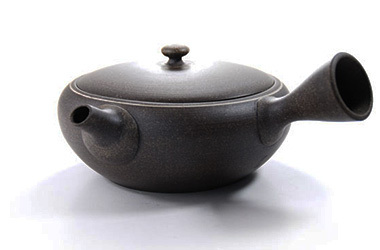 In Japan, green tea has been prepared for centuries in a clay >>teapot<< with a volume of about 150 to 400 ml. The clay has particular harmonising, energetically-favourable properties for green tea and perfectly contains the taste, as long as it is naturally produced. The >>Kyusu<< (Japanese: 急須 for earthen tea pot) was specially developed for green tea. It is also especially practical and has a favourable shape for filling/removing tea leaves, giving the tea plenty of space to brew and “breathe”. After an infusion, the tea leaves remain in the Kyusu without the water, due to the built-in strainer at the base of the spout. This prevents the tea leaves from being poured into the teacups and enables a second brew. Three different varieties of Kyusus are available: a Kyusu with a side handle jug (yokode kyusu), a rear handle (ushirode kyusu) and a top handle (uwade kyusu). Many beautiful handmade Kyusus are available to purchase; such a teapot is a must for the aesthetically inclined. What is more, they significantly improve the taste of good teas and last a lifetime. The Kyusu glaze makes them all the more beautiful and improves the taste of the tea. From a health perspective, it is also a good investment, as tea brewed in a Kyusu achieves almost optimal health results due to its material and composition. For on-the-go or in the office, a transparent tea glass (about 0.3 l) and a suitable-stainless steel tea strainer (preferably with two handles) can also be used. In contrast to a Kyusu with a ceramic sieve, when using a stainless-steel sieve, it must be swivelled rapidly for the last 30 seconds to ensure that the suspended tea particles pass through the narrow mesh into the tea water. Further details on this topic can be found in the article >>Tea Strainers for Green Tea<<. 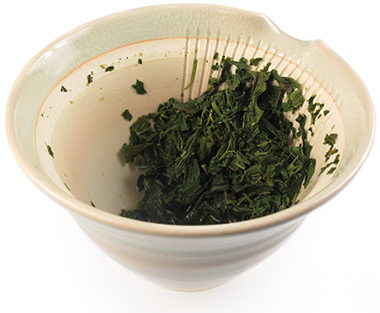 A Hohin (Japanese for treasure chest or magic vessel) or also Shiboridashi – a smaller Kyusu – are used for infusions of high-quality green teas (from super premium/gold upwards), such as the best Gyokuro from Uji. Its small size (approx. 100 ml) is particularly suited for the delicious infusions of these high-quality teas and facilitates a softer, rounder aroma. The Honin has neither a handle nor an integrated strainer. It only has narrow, elongated indentations, which keep the infusion in the pot. 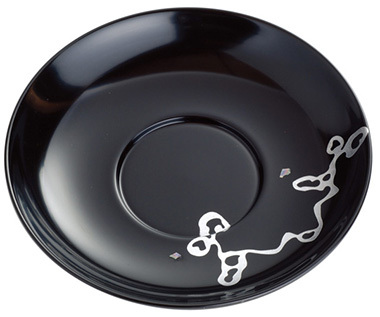 Hohins are often produced as special works of art within Japanese tea culture. Together with the Hohin, it is recommended to use a smaller Yunomi (teacup) of approx. 50 ml capacity. A Hohin or Shiboridashi is very beautiful item for high-quality tea; it is stylish and brings out the character of the tea in small quantities. As well as teapots made from clay, many >>cast iron teapots<< are also used in Japan. Cast iron is especially good at storing heat and the teapots are available in beautiful shapes and patterns (Arare, Itome, Hada etc.). They contain stainless steel tea strainers and are internally lined with a protective layer of high quality enamel. Tetsubin Kyusus are best used for strong, full-flavoured teas, as well as for herbal and Rooibos teas. Traditionally in Japan, the water for fine teas is heated or shortly boiled in an >>uncoated, cast iron kettle<< (Japanese: Tetsubin). The particular, activated iron of the kettle reacts with the water and considerably improves the taste of the tea. When water is boiled for a long time, Tetsubin can also be used to supply bioavailable iron. The best kettles are called >>Satetsu Tetsubins<< and are produced from iron sand. Although not traditional, electric kettles with temperature preselection and a digital thermometer are very practical and precise. An exact water temperature is decisive for successful tea preparation. The main factors here and a closer look at the kettles on the market can be found in the article: >>The Right Tea Kettle<<. A tradition Japanese teacups is called a Yunomi (Japanese: 湯のみ). It is slightly taller than it is wide and either porcelain or ceramic. 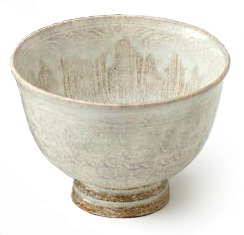 Whilst a Chawan (Matcha bowl, see below) is used for more formal purposes, e.g. for tea ceremonies, Yunomis are more for everyday use. Likewise, there is a wide array of Yunomis available on the market, ranging from the cheap and simple to the finely crafted and expensive. The size of a Yunomi is typically between 80 and 160 ml. There is also a special type of Yunomi called Meoto Yunomi on the market. Meoto means “married couple” in Japanese; Meoto Yunomi consist of two similar cups of different sizes and slightly different forms, as well as possibly also different colours. The larger cups symbolise the man and the smaller, the woman. A white or light cup interior is especially recommended, so that the tea can be seen better. Improved visibility has a positive effect on digestion and was already recognised as beneficial by the green tea “king” Lu Yu in the 8th century. Tea saucers are called Chataku (茶托) or Takusu (托子) and Takushi (托子) in Japanese. Even though nowadays cheap porcelain or even plastic saucers are widely used, the Japanese tea tradition uses beautifully crafted saucers made of the finest porcelain or from precious woods with multiple layers of lacquer. Of course, fine Chatakus add no health benefits to the tea, however they do influence the atmosphere of the tea drinking and can show off the teacups to their best advantage by means of a colour contrast. A Yuzamashi (Japanese: 湯冷まし) is a particular vessel for the preparation of green tea and is used in traditional tea ceremonies for cooling the water. In addition, Yuzamashis have a flat form with an especially large opening. The fine varieties of Sencha, Matcha and Gyokuro develop their best flavours when infused with water of the correct temperature. A Yuzamashi is a particularly lovely and convenient item to use if an electric kettle with temperature preselection is not available. Traditionally, refined tea kitchens in Japan use uncoated cast iron kettles for boiling water, which significantly improves the taste of the water. If boiling water is poured into a Yuzamashi and then into a Kyusu, the temperature is about 80 °C. Using a thermometer once, it is possible to track how long it takes for hot water to cool to the desired temperature in the Yuzamashi and then to simply keep note of this time for future reference. Like the Kyusu, the Yuzamashi is usually made of a special natural clay, and the selection of the right clay has a positive effect on the taste of the water. Although the taste of the water is not as good, a very practical alternative is the use of a kettle with temperature preselection. There are only a few devices on the market with this function and which reach an exact temperature. On-the-go, a thermometer is a good, quick alternative. A Chazutsu (Japanese: 茶筒) is an exceptional tea box, made specifically for the correct storage of green tea. These airtight containers ensure a much longer freshness and protects the tea over a relatively long period of time. Traditionally, the best Chazutsus are made from >>cherry bark<<. This wood has particularly advantageous properties for storage and a fine aesthetic. There is a plethora of tea boxes made from different woods on the market, some also with metal linings. It is advised to store tea in two different Chazutsus: a smaller box containing a little amount of tea for daily use, and a second larger box designed for refilling the first and intended for longer storage. Through this storage system, expensive teas do not have daily contact with light and air and so stay fresh for longer. 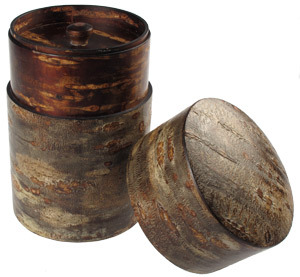 For even longer storage, tea can be kept in its original packaging within the Chazutsu. For this purpose, the air should be pressed out of the package. In terms of health and taste, storage in a Chazutsu made of cherry wood is the best option. The tea even ripens here and achieves a better taste. Also recommended, although not quite as good, are high-quality varnished Chazutsu from special hardwood (especially Zelkove). Metal tea boxes should be avoided. Storage of green tea in its original plastic packaging is okay as long as the packaging has not been opened and has a zipper, if possible. 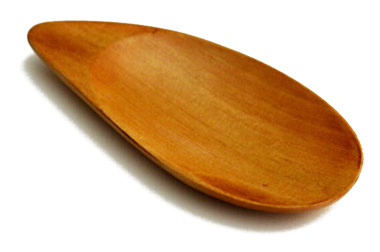 In traditional Japanese tea preparation, wooden measuring spoons called Sami are used. These are created to contain certain volumes to simplify the measuring of the tea, when it is moved from the Chazutsu to the Kyusu. Since different green teas have contrasting volumes, a variety of spoons are used. Samis are used in traditional tea ceremonies, created from different woods – for example, cherry, plum or camphor – and are normally varnished. 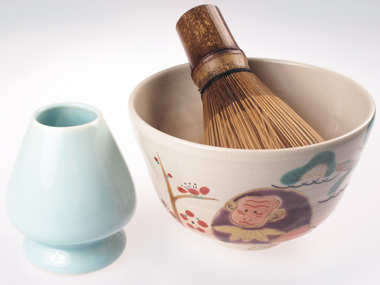 A beautiful Sami beside a Yunomi and Kyusu creates a special atmosphere in green tea culture. They are available in different sizes and are designed for tea quantities of 2 – 5 g. Since most preparation recommendations worldwide are usually given in teaspoons, the use of a Sami can be helpful. From an energetic health point of view, the use of varnished wood is particularly recommended when removing tea from a pack or tea tin. Metal spoons should not be used here. A Chawan (Japanese: 茶碗) is the traditional bowl for the preparation of Matcha. It must be large enough for the required whisking and frothing of the tea with the Chasen (bamboo whisk) and is therefore significantly taller and wider than a normal teacup. 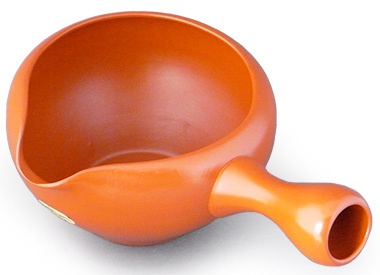 Chawans are usual made from high quality ceramic. According to Japanese tradition, porcelain becomes too hot for tea preparation and is not suitable for Matcha. The Chawan is a particularly important element of Matcha culture and tea ceremonies. Good Matcha bowls become more and more beautiful with time and increasing use; in traditional tea culture, it is hardly imaginable to make Matcha without the use of a Chawan. 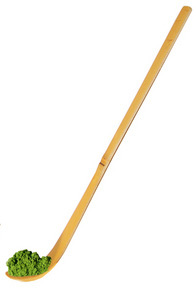 A Chasen (Japanese: 茶筅) is a small whisk created from one piece of bamboo. It is an essential tool for making Matcha properly. Particularly fine Matcha has to be whisked vigorously, otherwise it does not develop the right consistency and characteristic taste. The finest powder is almost impossible to mix with a spoon, as it does not develop its aroma properly and form lumps. Chasens have a different number of bristles (Pondates). A particularly foamy and fine texture can be achieved with a high number of 120 bristles. This is usually recommended for beginners. 80 Pondates are more suitable for the production of Koicha (thick Matcha). In tea ceremonies, Kazuho or Kurochiku Chasens with only 72 bristles from a certain bamboo are used; each Matcha school has its own preferences. Depending on the season of the bamboo, the colour is green (spring), partly black (autumn) or completely black (late autumn). The bamboo whisk can break easily when dry, so it should be placed in water for a few minutes before use. It is typically stored on a Kusenaoshi to keep its shape. A Kusenaoshi is a Chasen holder. With each use, the bristles of the Chasen lose their curved form a little more. Thanks to the tapered tip of the Kusenaoshi it fits perfectly to the Chasen, restores the bristles to their original shape and can thus considerably extend the life of the whisk. Chashaku are traditional, elongated bamboo spoons, which scoop the Matcha in the right dosage from its container. They are also used to push the fine tea powder through the sieve. Chashaku are very practical for lifting the Matcha out of its packaging or Natsume. They are indispensable for the tea ceremony and create a traditional Wabi-Sabi atmosphere (Japanese concept of perception of beauty). Chashakus are not essential for everyday Matcha preparation and can also be replaced by an ordinary wooden spoon. Fine Matcha however will usually stick to a spoon, so many regular Matcha drinkers quickly end up purchasing a Chashaku. Matcha powder should always be sieved before use to avoid the formation of lumps. While a normal tea or flour sieve can be used, it is important that it is the right thickness. 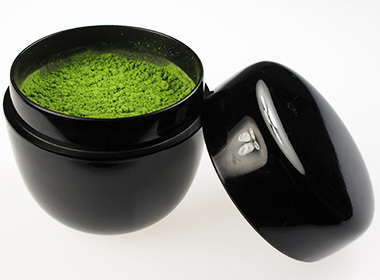 Special sieve jars (Furuikan) are available with an airtight closure through which larger amounts of Matcha can be sieved and stored without having to touch the powder. However, these are more suitable for larger quantities of Matcha (e.g. when cooking), as Matcha should not be poured directly into a mixing bowl. For normal preparation, it is better to use a fine sieve with handles and to push the Matcha through with the Chashaku. A Natsume is a traditional container for storing Matcha during a tea ceremony. It is however not suitable for prolonged storage, as it is not airtight; after each tea ceremony, any Matcha remaining in the Natsume is refilled into its main storage container. Traditional Natsumes are made of wood and coated with a shiny varnish several times. In many cases, cheap Natsumes are made of plastic. From a health point of view, Matcha should come into as little contact with air as possible and remain airtight. A Natsume is more suitable for ceremonial or special occasions and only a little Matcha should be added to it.